Ensuring Ontario students know about residential schools is part of the provincial government's response to the Truth and Reconciliation Commission report, says Ontario's Aboriginal Affairs Minister. David Zimmer, whose ministry is being renamed the Ministry of Indigenous Relations and Reconciliation, told CBC's Metro Morning that the $250 milllion announced Monday by the Ontario government over three years includes educational initiatives. He said the money will be spent on programs within five themes and one theme is "Understanding the Legacy of Residential Schools." "In this case, if we are going to reconcile the wrongs that derived from the residential school system, it's important that non-Indigenous people just understand what residential schools were all about," he said. "We're committed to teaching the coming generations about our shared history. We want to ensure that the survivors and the communities are the ones that share their stories, their historical stories, with the new generation and indeed with all Ontarians." Zimmer said more than 5,000 maps have already been sent to Ontario elementary and secondary schools. They show students the locations of First Nations communities and treaties in the province. Schools are also being urged to conduct age-appropriate instruction on residential schools. "It's about raising awareness of the dark history of residential schools," he said. On Monday, Ontario Premier Kathleen Wynne formally apologized for decades of government mistreatment of First Nations, Métis and Inuit people. 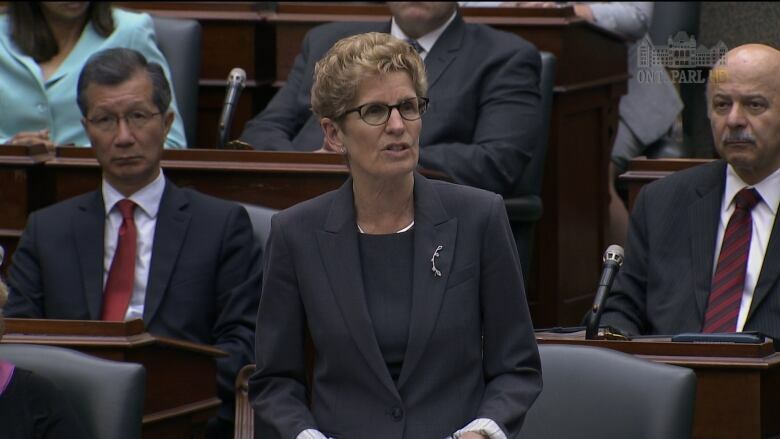 Wynne announced that the $250 million would be spent on 26 new initiatives. Her apology is Ontario's response to last year's 381-page report from the Truth and Reconciliation Commission on the abuses suffered by residents in Indigenous communities. The report found that children were physically and sexually abused and died in numbers that would not have been tolerated in any school system. The Ontario government also released a report entitled "The Journey Together," which details the five themes. "The Province is also working with Indigenous partners to enhance the Ontario curriculum in order to support mandatory learning about residential schools, the legacy of colonialism and the rights and responsibilities we all have to each other as treaty people," it reads. The document says the government is working with Indigenous groups to develop curriculum resources for teachers about residential schools. Zimmer said the apology is significant because it recognizes the truth of the abuse. "Canada's residential school system is one of the darkest chapters in our history. It has had lasting impacts on Indigenous peoples and on Canada and on Ontario as a whole. The apology was necessary. There can be no reconciliation unless we start with the truth of the situation," he said. Zimmer said the name of his ministry is being changed to reflect a new emphasis on rebuilding relations with Aboriginal Peoples in Ontario. He acknowledged that the ministry's name has been changed before by previous governments. "We've changed the name to properly reflect our emphasis on building relationships and on reconciliation. Symbols and language are very important in these matters," he said. Jesse Wente, CBC Radio pop culture critic, told Metro Morning that the government apology is one of many offered to Aboriginal people in Canada. When he heard the news, he thought of all his relatives, aunts, uncles and his grandmother, who went to residential schools. "Sorry is great, but what do we do to actually correct and fix the things that are broken? And there's so much broken," he said. Is there value in saying sorry for an historic wrong?